Coach's Corner - Walt Disney hand signed vintage invoice! Go Back to Lot List Walt Disney hand signed vintage invoice! 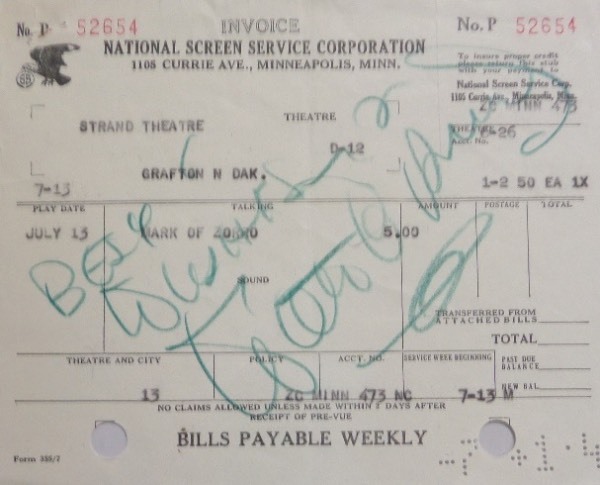 This National Screen Service Corporation Strand Theatre full invoice is still in EX+ condition, and measures about 5.5x7 in size. It is hand-signed in green artist's pencil by the entertainer/animator/innovator himself, grading about a 7, and including a Best Wishes inscription. Can frame and display on its own, or with any Disney flat item, and retail is high hundreds!